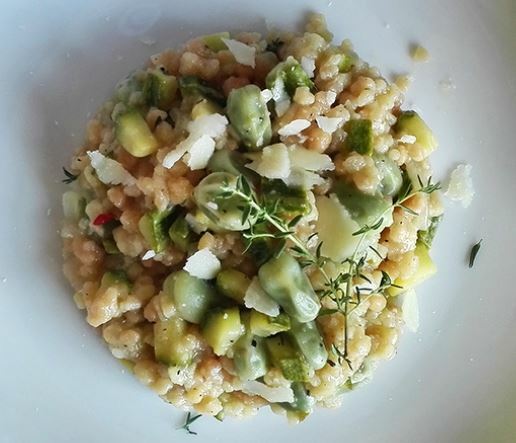 Fregola sarda with broad beans, zucchini and pecorino cheese. Fregola sarda are an ancient, Sardinian form of pasta that resembles couscous but which is cooked in risotto style dishes. This dish can be served hot, warm or chilled as part of your next salad. You can also add fregola to casseroles and stews during the final stages of cooking. 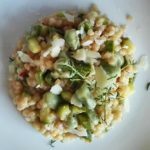 We have found many recipes that pre-cook the fregola in boiling water just as you do for everyday pasta. We wouldn’t recommend it since much of the flavor will be lost. Better to allow the grains to absorb all the wonderful flavors in your recipe, don’t you think? In a large frying pan, heat the extra virgin olive oil over a low to medium heat. Add the shallot and cook until lightly browned. Add the beans and cover the pan with a lid then cook for about 5 minutes. Uncover, add the diced zucchini and sauté for a few more minutes. Add the white wine, turn the heat up and cook until the wine has reduced by at least half. Now add the fregola, lower the heat to medium and add a ladle of vegetable stock and stir. The fregola will begin to cook by absorbing the fluids in the pan, just as it is used for risotto. Keep adding the stock as the fluids are absorbed, adding more or less as required. Keep in mind that this type of pasta is made up of irregular shapes and sizes and consequently the smallest pieces can get overcooked. Watch it closely and stir it often. When cooked, stir in the 2 tablespoons of pecorino and check the seasoning adding salt or pepper as required. Add the thyme leaves and stir in, then remove the pan from the heat. Serve with some extra grated pecorino.